Today is the last day of school for my kids! We’ve already made our summer bucket list, and talked about what I expect of them over the summer. When they were younger, I used to have them work on summer-bridge workbooks. Nothing too intense, just maybe a page a day. But now they are older, and those workbooks I was purchasing, aren’t really designed for older kids. So, this summer, my kids are reading books and writing book reports! I printed off a few grade level recommended reading lists and we are planning to go to the library today. If they read a book, then write a report about it (so I know they read it) every two weeks (5 books total), I’m going to take them to our local amusement park at the end of summer. They have to do it on their own however, I won’t be nagging them to accomplish it. And I am sticking to my promises- if they do it, great! If they don’t- they aren’t coming with the kids that do. : ) Do you have any plans or strategies to keep those brains working this summer? One thing that happens every summer of course is EATING! Lot’s of eating from my kids being home all day, and all the friends and neighbors walking through the house. My food bill always jumps once they are home. 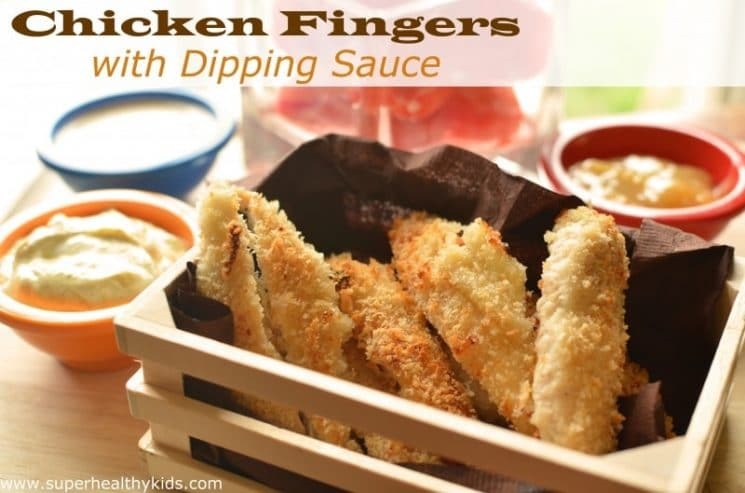 Our first meal of summer is chicken fingers with dipping sauce! 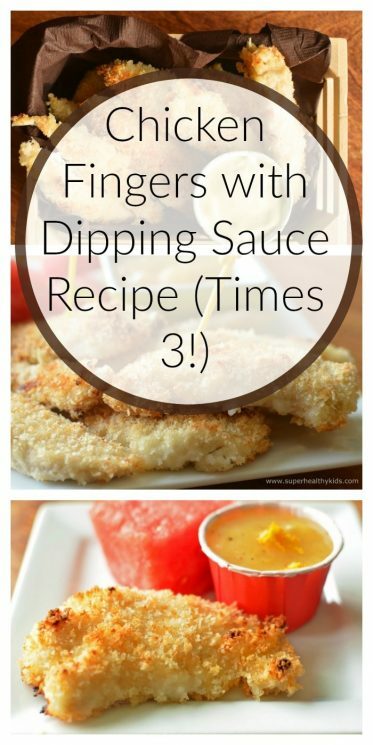 This Chicken Fingers with Dipping Sauce Recipe is easy to make, and everyone loves them! 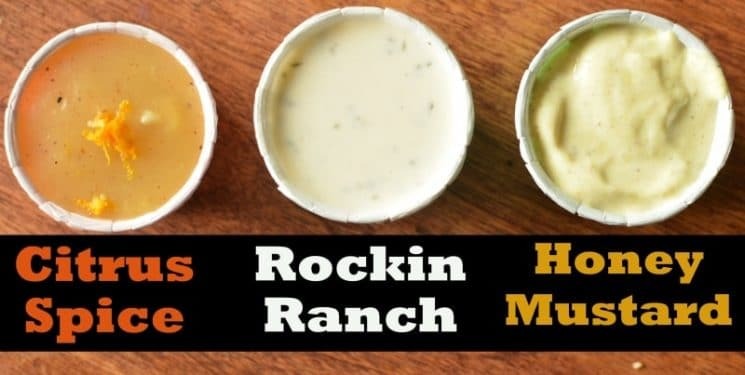 We made three different sauces, because what kid doesn’t love choices, right?? We made a citrus spice, ranch of course, and a honey mustard dipping sauce. The Ranch was a crowd favorite, but all of them got eaten. Mix all ingredients in a saucepan over medium heat. Boil until begins to thicken, just a few minutes. Mix all ingredients in a small bowl. Chill until ready to eat. Mix all ingredients together and chill until ready to eat. 1 bowl of panko with seasonings. 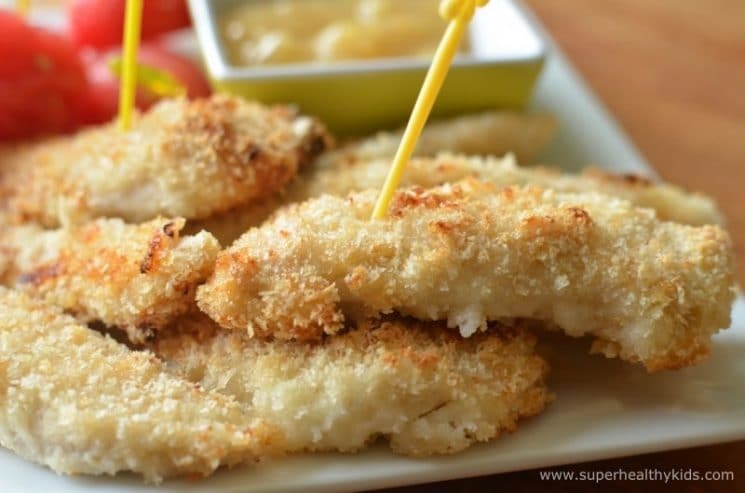 We dipped 1 lb of chicken tenders into the yogurt, and then dipped into the panko. Arranged in an oven safe baking dish, and then drizzled a touch of olive oil over the chicken. This will make it crispier, just like fried chicken! For a balanced meal, serve with fruit and veggies! Watermelon is perfect for summer dinners, but we also love a green salad! 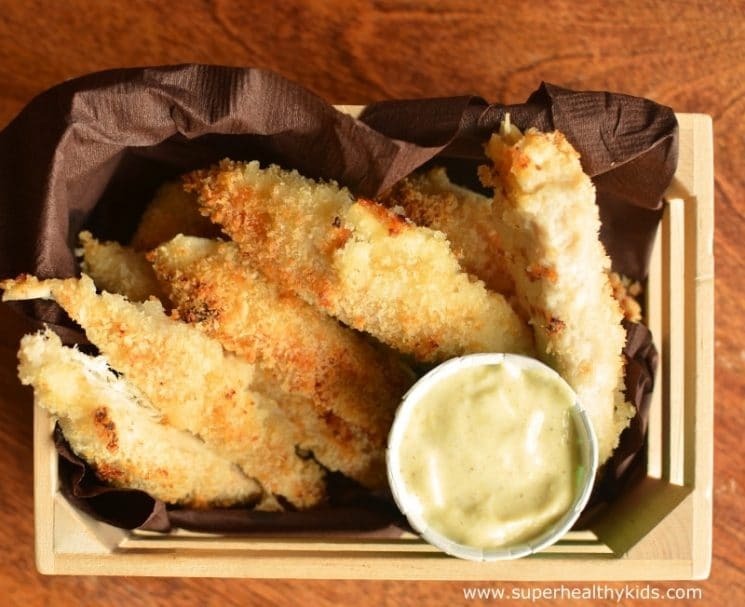 Want more chicken strip dips? Link up your favorite dip recipes in the comments! 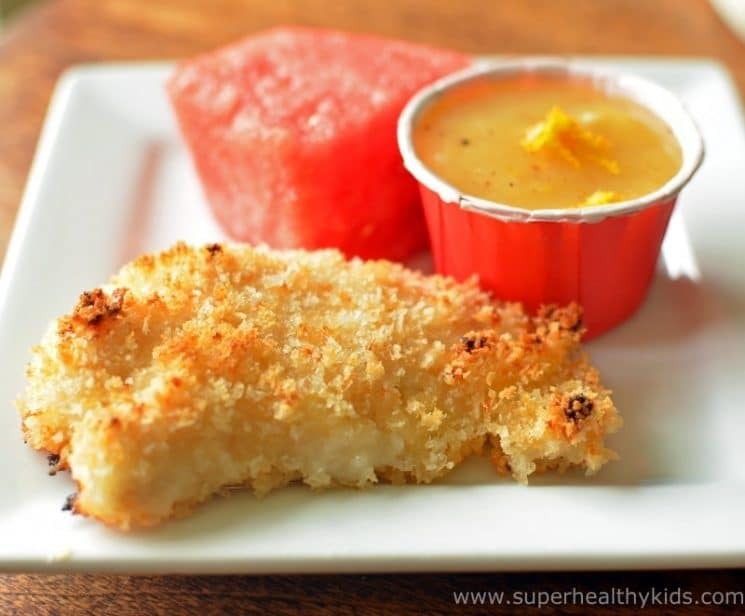 Dip chicken into yogurt and coat on both sides. In a seperate bowl, mix panko, salt, onion powder, and garlic powder. Dip yogurt covered chicken into the Panko with seasonings. Spray a 9X13 pan with cooking spray and arrange chicken tenders in pan. Drizzle with olive oil. Bake at 350 for 20-40 minutes, or until chicken is cooked through, and no longer pink. Love your summer fun learning idea. We are doing a word a day. My daughter is 5. The challenge consists of mommy/daddy presenting her with a written word of the day, she then looks it up in a junior dictionary and reads the defination. Then she is supposed to try to use the word three times in the day and practice spelling it. The we tape the word into a big frame I made on her playroom wall. So far she loves it and it will be tons of fun at the end of the summer to see all the new words she has learned. Great idea!! thanks for sharing Renee… My grandma- who is super brilliant (she was a judge until she was almost 90 years old!!) would have a word of the day as well… I think she still does it! Wow that chiclen looks hot! Im off to try and make that for the kids! Studio Paci, consisting of Chartered Accountants and Auditors based in central Milan, offers a wide and varied range of professional services, tax, corporate, accounting and administrative consulting, to domestic and foreign customers. Have you ever frozen these and then re-heated at a later date? Thanks! I’ll try this with Spelt bread crumbs. 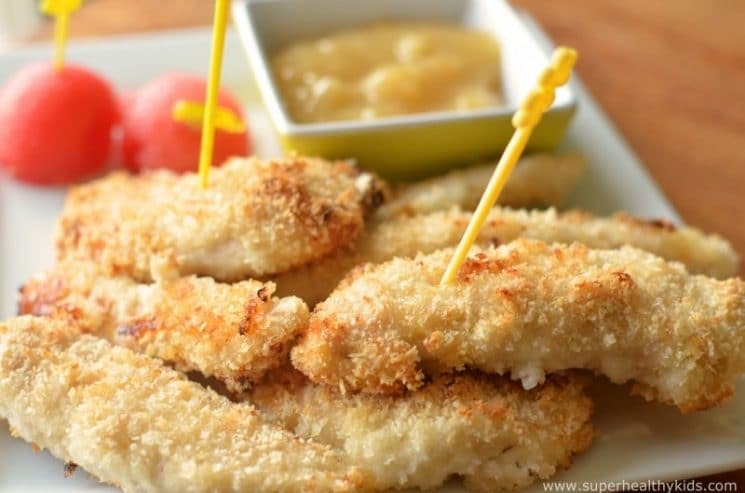 I find Panko depending on the brand have questionable ingredients(like GMO wheat, soy etc..). The Spelt bread crumbs from Sasha Co. are an excellent alternative. Interesting! Thanks for the alternative @Everything Mom and Baby! Can these be made ahead and frozen for a birthday party?? ?if so would convection be better to heat them up?! For sure Maria- they reheat very well. A convection oven would work just fine. 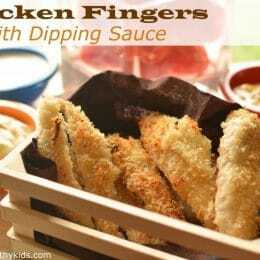 My husband – who loves boxed frozen food (blech)- said that these chicken fingers tasted better than any store bought! Hooray! Sometimes husbands are even harder to please than kids, so this makes us so happy! Thanks for the great feedback!